Penzy Guesthouse i Koh Samui, Thailand : Boka nu! Located at the attraction center of lively Chaweng Beach and within easy quick walking distance to the beach, entertainment, shopping, banks and other places of interest. Delicious Fuji Japanese Restaurant and Tomo Brasserie French Restaurant are located on the corner of our street. At Penzy Guesthouse we also provide updated island information and news information and tours of the island and where to visit during your stay. We can also arrange speed boats back and forth to the Full Moon Party, thus who don't want to stay in Koh Phangan for the usual 5 night minimum, you can just stay with us. All your needs for a memorable stay are provided; room with Air Conditioning, hot water, TV, DVD player, DVD Library, Fridge, Complimentary Coffee, Digital Safe, Free WiFi and always happy assistance from our staff. 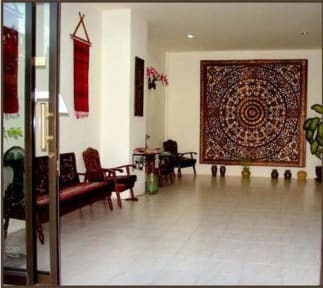 Our Guesthouse provides a restful place to relax and plan new activities or just do nothing and enjoy Samui. There are still private and romantic hideaways to be explored and see the Samui of yesterday with a visit to the Main Nathorn town and enjoy a dinner while watching the Samui sunset into the ocean. In the evening stroll to nearby restaurants offering eating exploring experiences from Indian, European, Spanish, Italian, and of course tantalizing Thai with Thai seafood delights. Late night entertainment, music, and dancing all are to be found near Penzy Guesthouse and when you are exhausted and need to regenerate, a quick walk brings you back to your room to sleep and dream of more things to do in the new day. 2 room nights will be charged. Early Check outs: same as above plus one extra night. 100 % charged total booking night . minimum 3 nights stay required.